People say first impression always count and you bet it does. As soon as I had stepped into the room, a whiff of marinated bbq rushed through my nose. It was so exotic. The place was quite funky in its own unique way, especially being in the bakehouse lane it had all the olden arched walls turned into massive windows that were in par with the pathway. It is one of those places where it would perfect to go to during summer where you can barbecue away your meat while chilling with the summer breeze coming from a gigantic opened window in a peaceful laneway away from the busy CBD. As we were guided to our tables, I noticed that approximately 90% of the remaining tables were marked reserved; talk about being popular! 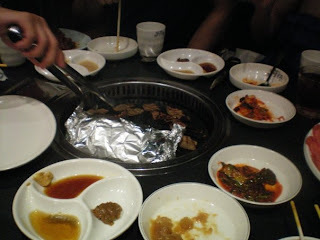 Not long after we ordered, the meat had came out but I guess that is expected since after all it is korean bbq. The bulgogi came in a disposable aluminum container which was placed on the BBQ and it was heated up in the container with the sauce bubbling away, however eventually you had to quickly barbecue it before the meat bubbled away. As creative as the idea of the disposable container was, the marination of the meat seemed to be lacking unlike Madang and the servings seemed a bit smaller than most other places (even the rice seemed a tad smaller!!). The ox-tongue however tasted very standard in a good way meaning it just tasted like every other place. Luckily we had ordered another dish, buckwheat cold noodles. Again, it was nice but I personally thought it wasn't that up to scratch unlike other places. It had the nice thin noodles which weren't over or under cooked but the soup itself didn't have the same sweetness as it should have been. Even though the price seemed cheaper, the serving itself seemed smaller but being in a place such as Bakehouse it is some what expected to be a bit more expensive and less value for money. Service itself was fairly good, waiters were running around everywhere so even though you did not have the buttons it was fairly easy to catch their attention. If you haven't been, I would said say do not fear because you are not really missing out as you could probably find other places with better food and more value for money. In saying that however, I would not only support those who are willing to give it a try because it is worth trying but I would also say it is a place I would (eventually) go back again to. Besides the word 'free', nothings beats satisfying expensive taste at only half price! Lobsters, crabs, oysters, mussels, sashimi, squid, prawns; i.e. luxurious seafood is the way to go! Four Points by Sheraton is currently doing a special of having 2 people dine for the price of 1 and unless you were allergic to seafood how could you say no. Seafood plate filled with prawns, champagne lobsters and oysters. The seafood there was fairly reasonable. The oysters weren't the best since after all it is only a seafood buffet and not the fish markets however they were good enough, especially because it did not have the bad sea taste. The champagne lobsters were fleshy and sweet (and to an extent addictive LOL) however the crabs on the other hand were a disappointment as they were so tasteless and merely sweet. The mussels were also tasteless but I thought it was okay only because it was covered in cucumbers, tomatoes with a dressing on top. Prawns were average but in saying that I have had worse at other buffet places. Unfortunately the sashimi was not fresh so it tasted more like a piece of flesh and nothing more. 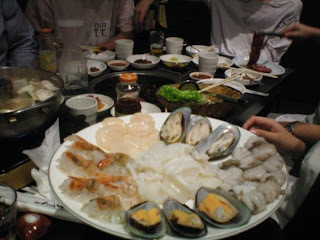 Seafood Plate filled with prawns , champagne lobsters, crab, oysters, mussels, squid salad, sashimi (Tuna and Salmon). Besides the cold seafood bar, there was also the hot food section which had dishes such as dory and salmon fillets with an attempt of an asian touch to your typical fried rice (which wasn't too bad actually). I thought that even though it was a seafood buffet, it could do with a few more mains to increase the variety. At the dessert bar, desserts came and went with different platters of cake or tarts each time. It ranged from caramel slices, mini orange and cream tarts (both of which were the highlight for desserts), rich chocolate mud cake, mini profiteroles, eclairs, fruit and many many more! A piece of advice is for you to caution if you are going to sit near the kitchen door like I did because it only makes you want to get up and go for more, especially when it came to the desserts because each plate was always different. Bad for the calories though! Dessert platter which had almost one of everything. They also had a dried food section which had crackers, nuts, cheese, prawn chips, bread rolls and other cultural breads and more carbs! The service wasn't too bad, all their staff were friendly and professional but I guess that is expected from Sheraton since after all it is a 5 star hotel. The only problem I had was with the pace of the waiters clearing out our table - we clearly were starving and ate faster than they could clean LOL. The place looked clean and the ambiance was really relaxing yet classy meaning you can eat in peace without feeling that you have to rush by stuffing x amounts of food in your mouth every 2 seconds. Personally, I would definitely recommend for people to go as it is money for value, given that you have the 2 for 1 special. Paying $60 or more for a lunch or dinner as I had described above is not really worth it in my opinion. If you are interested in going and the special is over, I'd say wait it out for a few months and you'll be seeing that offer back in town again. I used to think that eating at a sandwich in a cafe located in the heart of Sydney would be a rip off, well not anymore! If you are sick of trying to find value for money healthy food in the city then I suggest for you to look no further than Little Vienna. Yes that's right; a tiny cafe that sells amazing sandwiches which are definitely value for money and I dare say to those growling stomachs out there that their sandwiches can be more filling than a footlong subway! Its not everyday you come across cafes that sell sandwiches that are probably bigger than your face for less than 10 bucks! Vienna Grilled Chicken on Brown Bread vs Hard Crust Bread - BOTH $8.95!! The flavour of the chicken isn't too strong which is good because it won't make you sick of it at the end of your meal. The grilling is grilled to perfect. How so? The grilling itself isn't too smoky so you can still taste the juiciness of the chicken with a touch of the BBQ flavour. Sandwiches are made fresh each day and if you order if on hard crust bread its even more fresh because it is made on the spot. The wait isn't too long so its perfect for a quick bite during lunch! There really isn't much of an atmosphere because there isn't that much seating. There are a few seats outside and in a few branches there are some inside. To make up for it though, there is a newspaper bench for people to catch up with the news while waiting for their sandwiches! So if your hungry and wanting to find something cheap, healthy and fast, I strongly suggest Little Vienna. It is a cafe located in various areas that never fails to satisfy, especially those whom have a massive appetite. Finally, to the girls out there whom have a more of a petite sized stomach, never fear in being able to finish it. Why? Because its that massive to the point where you can still share it with another girl AND still be full. Hey, its softer on your wallet too! People crave food all the time from kentucky fried chicken, pad thai noodles to a freshly grilled woodfire pizza. I crave Madang, one of my personal favourites actually. If you pardon the wait while in queue, you are faced with one of the best Korean BBQ Resturants. I still remember my first time there; it was like your 11 secret herbs and spices exploding throughout your whole entire mouth. The tendernous and juiciness of the meat along with the balance of the marination makes it oh so perfect. The price isn't too bad if you have the chance to share with at least 4 people or more. The bill comes to approximately $25 bucks per person (given that you do order a bowl of rice each) for you to crawl your way of the restaurant. If you were to compare it to a $30 pp korean BBQ that usually has poorly marinated meat then I say Madang offers value for money! I remembered one time, I was in a group of 5, we ordered both Korean BBQ AND Hotpot and the bill came to around $25 per person. It was amazingly cheap and my stomach felt like it was going to explode like a terrorist attack!! However I do admit that if you go in a group of 2 to 3, things can get expensive! The average price of a BBQ meat dish is around $16 bucks or so (if i recall correctly). Seafood Platter - Sadly I do not remember the price so i shall update this when I revisit but it def was again, value fo money. The ambiance is really lively because the place is always so packed and popular however because it is so popular, waiting in line can be a pain. A typical Friday night wait at around 6.30 is at least 30 minutes BUT in saying that, in my opinion if you aren't in a rush and if you have the time to wait - it is DEFINITELY worth it! Some however have said that it taste like any other Korean BBQ. For me personally, it is the ultimate Korean BBQ so for those who have not yet tried, do not miss out! It is a must have! Service tends to be fairly decent. Majority of the times, the waiters are attentive but I have had experienced times where you have to ask/push the bell 3 times to order an extra bowl of rice or drink. As for location, Madang is located secretly at the end of an alley way branching out from Pitt Street. I guess part of that is what its even more special.